THE Supreme Court’s Central Empowered Committee (CEC) has cleared the way for Dhamra port in Odisha. It did so by overruling a site inspection report of the eastern regional office of the Union Ministry of Environment and Forests on August 17. Interpreting a state government notification in favour of the Tata-sponsored Rs 3,200 crore project, CEC recommended to the apex court that the port area be treated as non-forest land. Environmentalists who moved court against the project in September 2009 had alleged the 300 hectares (ha) of land allotted for port expansion was part of a protected forest. A 1961 state notification declares the forest and wasteland in Kanika Ex-Zamindary, a pre-independence zamindary estate in Bhadrak and Kendrapara districts, as protected forest. While the notified forest blocks were not demarcated on ground, environmentalists claimed the blocks overlapped the port area. They alleged the port violated the Forest Conservation Act of 1980, as permission to divert forestland was never sought from the Centre. Dhamra port, being built by the Dhamra Port Company Ltd, a joint venture of Tata and Larsen and Toubro, is to start functioning in September-October this year. The regional office of the environment ministry inspected the site in January this year. Its report said the eastern boundary of the former zamindary extends to the Bay of Bengal coast, which overlaps the port area. “At the time of notification, the coastal areas were mangroves or mudflats (wastelands). The port area was not demarcated for any use till 1982 and hence was treated as wasteland. The 1961 notification superceded all previous orders on the subject and the port is a part of the protected forest,” the report said. The state government opposed the report, saying the port area was unsurveyed land under the Survey and Settlement Rules of 1962. It also claimed the site did not come under the 1961 notification. The ministry too disagreed with its own regional office. A team deputed by the National Environment Appellate Authority (NEAA) was the first to notice the forest violation during a site visit in 2000. The environment ministry’s regional office called for action against the project. State forest department officials expressed worries over the violations in their internal correspondence. But no action was taken to demarcate the forestland or stop the project. 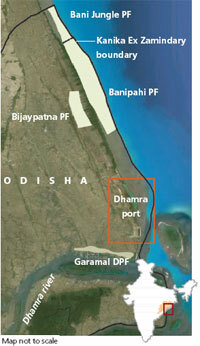 It was only after the case was filed in the apex court that the forest blocks and port area were demarcated (see map). The map prepared by the state after demarcation showed the port area was not in the four forest blocks; the protected forest under the wasteland category, as per the notification, was still not identified. Biswajit Mohanty of the non-profit Wildlife Society of Orissa said the CEC gave its decision without checking ground facts. The company agreed to pay Rs 30 crore for wildlife and habitat conservation on the recommendation of CEC. If they have done nothing wrong why pay the amount, asked Ashish Fernandes of NGO Greenpeace. It has already been proved more than once that Greenpeace would not stop from resorting to the vilest means to attract publicity to any campaign they have started. Even if that campaign may not have any element of justification to it whatsoever. In the matter of port construction at Dhamra too, the NGO has resorted to meaningless emotional outbursts without heeding to any scientific reasoning. Apart from publishing a falsified report on its website, for which it faced strict consequences from the Orissa Government, Greenpeace has contributed precious little to the cause of the environment. This time, the lies of Greenpeace stand exposed yet once again. A letter of Government of Orissa, from year 2000 clearly states that the port area of Orissa does not come under any forestland. Therefore there has not been any violation of the provisions mentioned in Forest Conservation Act. This confirmation has been received in 2000, at a time when Tata Steel had not been a part of the venture at all. It is a definite proof that Greenpeace has misrepresented facts from the beginning. They have wanted to prolong the agitation and conveniently overlooked the fact that the actual port site at Dhamra is far removed from the nesting habitat of the Olive Ridley Turtles. It is really time for Greenpeace to curb their lying habits and become more responsible in matters concerning the environment. The Dhamra Port Project in my opinion is not only one of the most pathbreaking industrial initiatives for the State of Orissa but also one of the most responsibly undertaken. For quite some time, dissenters like Greenpeace have been raising voice against port development on the grounds that the nesting of Olive Ridley Trurtles would be adversely affected. It has been proved beyond doubt, both scientifically and by Nature's own rules, that such a fear is absolutely unfounded. The activities at Dhamra stringently follow rules and norms set down by IUCN and here several measures have been employed in order to safeguard the nesting habitat of turtles, including the use of turtle deflectors and special turtle-friendly lighting at the port. Also, the main fact is that the actual port site is far removed from the nesting beaches and lie beyond two river mouths that create a natural barrier. The Port Project has also been welcomed by the people of the region as it has brought about significant improvement in their socio-economic condition and holds more promises for the Future. In both 2009 and 2010, the beaches of Gahirmatha have seen turtles flocking in record numbers, perhaps with the mission to prove that nature and industry can always co-exist peacefully if proper accountability is maintained. Check out this video - http://www.youtube.com/watch?v=eXJ9x8_sEQQ to know more about the Port and also about Arribada.